BAMM AGM and Forum. Saturday 8th October, 2016. The 2016 BAMM Mosaic Forum will be returning to the King’s College Waterloo Campus in Stamford Street, London SE1 9NH, where we held the 2014 Forum. Gary will talk about his experience in Bogota, Colombia. 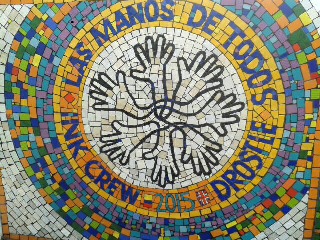 Los Manos de Todos: Graffiti, gangs, punk and mosaic in the barrios of Bogota. 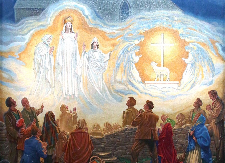 The mosaic, unveiled on 28th February 2016, depicts the Apparition at Knock in 1879. Irish artist PJ Lynch designed the mosaic, which was crafted by Travisanutto Mosaics of Spilimbergo. They spent 8 months creating the mosaic, which was then transported in 300 sections to Knock in Co. Mayo. The mosaic measures 14 metres x 14 metres and consists of more than 1.5 million tesserae. Fabrizio from Travisanutto will talk about creating the mosaic from the designs. Walter will talk about installing large scale mosaics, for mosaic artist like Emma Biggs and Tessa Hunkin. 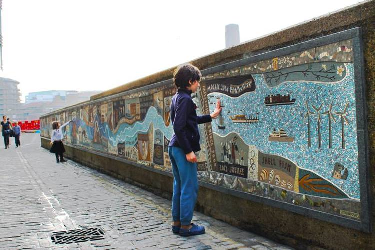 We will show the film of the installation of the Queenhithe mosaic in London. There will be a question and answer session, for which we would like questions in advance. Please see the newsletter nearer the time for details of where to send your questions. Chris Smith worked at his company Art Pavements for more than 20 years. The company was dedicated to restoration in finished, architectural surfaces specialising in mosaics and tiles. He worked on many of the Roman sites in the UK and abroad, including Fishbourne, Bignor, Littlecote amongst several hundred other restoration projects. He also worked extensively with London museums such as the British Museum, the V&A and the Museum of London as well as being responsible for the fabrication and installation of many modern mosaics, including Paolozzi's Tottenham Court Road mosaic and the entrance to the Royal College of Art. In his talk Chris will share the complexities of one aspect of his Roman mosaic conservation and restoration work. We spend many hours making mosaics to then find that the photographs we take don’t do them justice. Issues such as reflections of the light source cause us problems, especially with mosaics consisting mainly of glass and mirror. Amanda will give an introduction on how best to photograph your works, and offer some practical insights of how to overcome some of the most common challenges you may encounter. 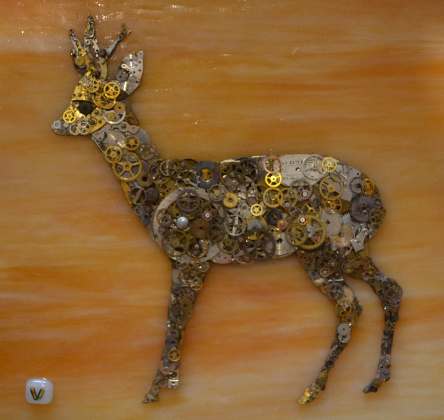 Stephanie's mosaic art has been developed from her studies into nature and industrialization, landscapes and materials, environment and harmony. She has developed a mosaic processes that enables her to create 'height contoured' forms that allow her to entwine juxtaposed mosaic and steel materials, creating a sense of visual harmony, while keeping their distinctive independence. Her subject matter reflects urban life-styles and personal interpretations of how she sees we may be influenced by an urban industrial landscape. This has led to her creating many personal studies that reflect her female presence in a male dominated working environment, to commissions that celebrate the legacies of Newport, South Wales: vibrant and culturally distinctive industrial heritage. Stephanie’s talk will be entitled ‘Contours of Steel’. 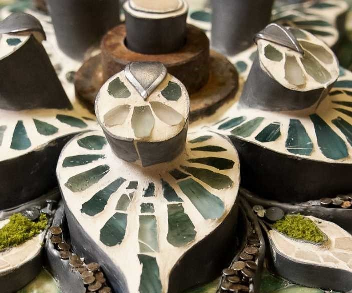 The process of creating mosaics that uses a 'height contoured' process, a distinctive handling of materials. Joanna Kessel MA RCA studied at Edinburgh College of Art and the Royal College of Art. In 2010 she received a research and development award from Creative Scotland to study contemporary mosaic in Italy. Joanna runs Edinburgh Mosaic Studio and specialises in the design and fabrication of mosaic artworks for domestic and public spaces. She creates exquisitely crafted contemporary mosaics for exhibition and shows work internationally; Palazzo Tadea, Spilimbergo (2016), the mosaic Biennales in Ravenna (2015/13) and Chartres (2014). She runs a popular mosaic course programme from her studio and in Italy and has been a BAMM Committee Member since 2014. Joanna will talk about sources of inspiration in relation to her recent work ‘(In)visible Cities’ informed by Italian architectural mosaic and the beauty of ‘unseen’ glimpsed spaces. Jane Visick is a professional mosaic artist working on private commissions, public installations and art pieces for galleries. She also runs workshops from her home studio in Hertfordshire. She uses stained glass and found objects and has recently begun a series of watch part mosaics on stained glass. She takes her inspiration from the natural world, finding that stained glass gives her the range of colours and textures she is looking for. All her glass is cut by hand and she loves to add tiny details to draw the viewer into the piece. Jane’s slides will cover the production of a watch part mosaic and show the layering process she uses to produce a silhouette image. Tamara Froud has been a mosaic artist since 1999. She began combining her teaching skills with mosaic, doing large scale community projects as well as private residential work. She has also worked internationally and took part in the Chilean Intervention. The Mosaic Market is a popular part of the Forum. As usual we will have a selection of suppliers to tempt you with their wares! Many of the Market stall holders support BAMM in other ways, so do support them – and buying direct means you see just what you are getting and save on postage! We are trying a different format for the evening event this year. We’re taking over Blackfriars Wine Bar, close to the Forum venue, for a more informal get together. BAMM members will have exclusive use of the venue between 6pm and 11pm, with a pay bar and buffet style food. Tickets will be £10/£12 - more info to follow – including thought about how people can put names to faces to encourage networking. This year we expect to be able to provide an even wider selection of workshops, including sessions focusing on technique and working in mosaic as a business. So make sure you’ve saved both days in your diary, and keep an eye on the BAMM website and the monthly newsletter for updates on the weekend.